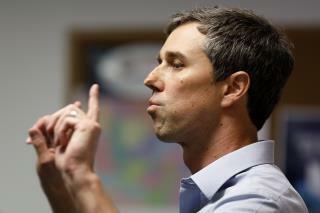 (Newser) – If President Trump faces Beto O'Rourke in the general election, he apparently has two lines of attack ready: The Texan's hands and name. The president mocked the Democrat, who announced his candidacy in a video Thursday, for moving his hands too much, Politico reports. "I've never seen so much hand movement," Trump told reporters. "I said: 'Is he crazy or is that just the way he acts?'" He added: "I've actually never seen anything quite like it. Study it. I’m sure you'll agree." Trump wouldn't comment on whether he saw O'Rourke or Joe Biden as the bigger threat, but said: "Whoever it is, I'll take him or her on." ...he said while making small circles with his tiny hands ...as he always does. Foxnews has a doctor saying that O'Rourke is a dangerous mental patient because of his gesticulations .... its Fascism 101 and ironically Alinsky tactics.